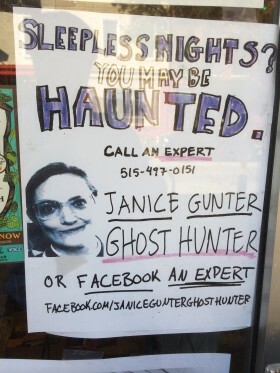 Is There Really a Janice Gunter, Ghost Hunter? Who is Janice Gunter? With handmade postings anywhere from Williamsburg to NYU advertising her strange services and conveniently-rhyming name, it would appear that this bespectacled woman is the latest to join the ranks of NYC’s colorful flyer characters. Visit Janice’s Facebook page and you’ll find nearly six month’s worth of ghost-related status updates, bad jokes, and musings about her Ma’s tendency to videotape everything they do. Janice also has an Instagram and even a LinkedIn profile, where she explains “[g]host hunting is officially classified as a pseudoscience, but my customer service and attention to detail are more like an art form.” She also worked as a cashier at CVS for an impressive eight years before deciding to follow this ghostly path.